The M020 is a robust enterprise retail payments solution that you would expect from Miura. It’s a low risk modular approach with many innovative plug and play peripherals to empower retailers in any payment environment. With the M020, it’s never been easier to deliver an enhanced payment solution for all retail verticals and every POS challenge. The public launch of the Miura M020 was on our stand at RBTE 2018. Secure Retail is Miura’s new and exclusive distribution partner for the M020. We have been selected by them as a trusted provider of high security payment software and hardware in the UK and globally. Miura chose to partner with Secure Retail since the company shares a clear vision of improving efficiency, productivity and the customer experience for retailers. 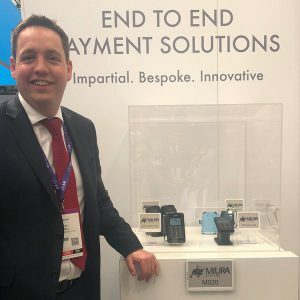 David Russell, Managing Director of Secure Retail, said “We are proud to be the exclusive distribution partner of the Miura M020 in the UK and Ireland. We see the M020 as an integral part of our business growth over the next 2-3 years and are excited to be showcasing the M020 at its first public launch at RBTE”. If you would like to find out more about the Miura M020, please call us on +44 (0)1530 511150 or email us.